Now, I’m going to advice, before you proceed, please calm down, because what I’m about to say will have so many people up in their feelings for the wrong reasons – unless of course, you calm down and understand the point. Anyway, if you didn’t know, HRH PRINCESS HENRY OF WALES is one of the official titles of the American Actress, Meghan Markle who married the prince of England and 7th in line to the throne. Social media has been awash for some days with a picture of her holding an umbrella for her husband. That, of course is a sweet gesture which should be a normal occurrence and emulated. Imagine my horror when anti-feminists began to use it to score cheap points. First, they came for Chimamanda and said she’ll be rolling over in anger. Bless her soul, she was in the UK at the time, receiving another award to add to her collection, with totally no idea of the wiles – of course. I don’t usually like to address these kinds of issues because I’ve come to understand that Nigerians only see things from the angle that suits them, but the fact that many people don’t know the truth of what they’re saying makes it pertinent, sometimes to pour out facts. First of all, this was not a point for anti-feminists, because Meghan Markle has always identified as a feminist. Google search will prove this and her various articles and works championing causes for the girl child and anti discrimination causes. So, it’s quite funny when people misconstrue one picture to mean that she has dropped or never had her social and political values. My question, what’s the big deal in an umbrella? Or is it because in Nigeria, PDA among married couples is so unheard of that when it is done, they assume it’s one person submitting or groveling at the feet of another. Funny enough, around the same time, a picture of Donald Trump emerged where he left his wife in the rain and kept the umbrella all to himself. Color me surprised when social media was quiet. I guess because, of course, he’s a man. He’s allowed to be one, to not show affection, courtesy or simple common sense. Meghan is a woman, so they would try to score cheap points off her holding her umbrella for her husband, because you see a woman was made to serve a man (holding an umbrella is same as licking his shoes to Nigerians, it’s that big of a deal, I mean, it can’t be simple as protecting your other half from the rain) and of course, it’s a taboo for a man to serve a woman. Hell, most men do not take orders from women even if they are higher in rank than them or their bosses, it is a swipe on their ego, but I’m just saying. Before I proceed, I’ll like to say that Feminism is not a man-hate movement, and the people that believe it is, refuse to do research on the aforementioned but choose to juxtapose social media for real life. In view of that, people always see what they want to. I mean, the cup is either half empty or half full, depending on your perspective. When Meghan quit her job and social media to marry the prince, they thought it was a blow to the feminist movement, when it’s the same thing we’ve been saying all along- Let the sacrifice be equal on both sides. Royals are not allowed to work, own social media or talk to the press, it’s not even a man-woman thing, all royals do not work, male or female, it’s as simple as that! They serve a greater purpose to the state. This was an upgrade for Meghan. Harry doesn’t have a day job, so this was not Chikezie from onitsha telling Meghan Ekwerenmadu to quit her banking job in Lagos and move to nnewi with him and teach in a community primary school of five students. Being a royal is the biggest Job she will ever have and her name will ever be in the sands of time. Remember also that the queen is a woman. She makes the rules, not Harry. Oh, I forgot, they’ll be quiet now. Before we begin to think of comparing H&M with the Nigerian scene, let us remember they are not Africans and have an upbringing that does not repress women. Harry is not the man from Ondo state that will beat his wife for coming late from work, or cheat with the maid, or the man from Kaduna that will tell her she’s getting too fat, so he has to look outside, or the Igbo man that will tell her to resign even if his job cannot cater for the family, all for him to not feel emasculated. Harry will not expect Meghan to Bow and Scrape and worship the ground he walks on. 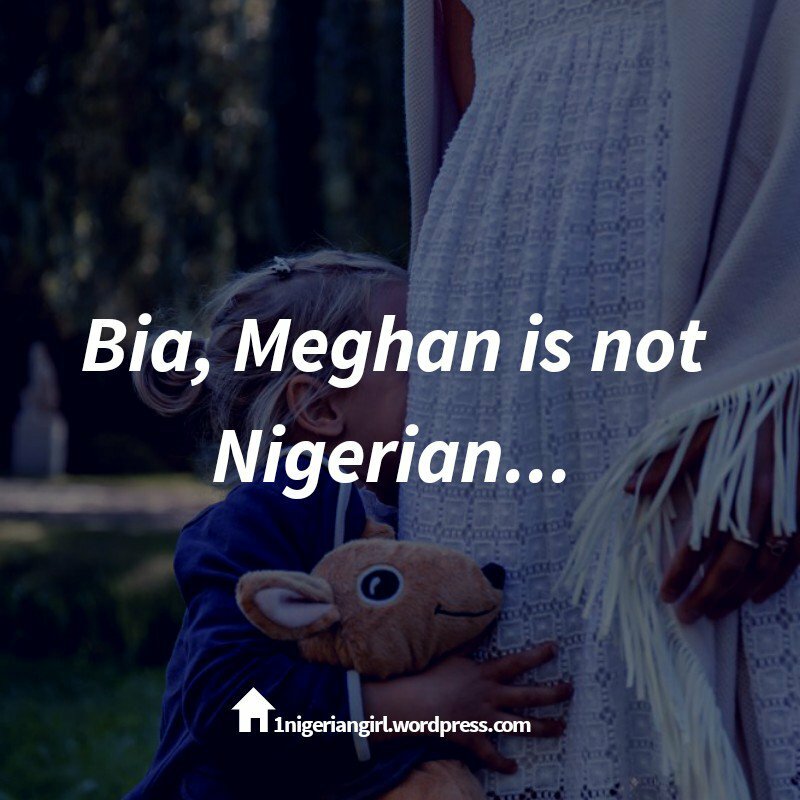 Before you say that they are not feminists, Meghan will never cook a day In her life or wake up 4am to prepare for the children’s school while Harry sleeps, or leave the office early so her husband will not be upset if she’s not home to make dinner, because you know, Nigerian men are babies but want respect given to adults and are handicapped that they cannot cook, wash dishes or their own underwear. Most of their reasons for getting married is so that another human can feed and take care of them, like a pet. Feminism is the movement that already recognizes women as strong but aims to change how the world perceives that power. However in Nigeria, when you’re called a strong woman or a boss lady, more often than not, it’s not a compliment because you see, women are not expected to be strong, have strong opinions or have a bold/independent front. Then, you’ll be seen as trying to be a man because women are expected to be seen, not heard. I saw someone I know on Facebook, and before I thought of sending a friend request, I went through her profile as I always do before I send or accept, I need to be sure of what I’m bringing into my space. She had a few good literary pieces and just before I could scroll up and click add friend, something caught my eye. She made a post where she advices chimamanda to teach girls how to dress and look pretty and not fight positions with men. My eyes were wide open, and you can guess the gender that cheered her on. Before you turn up your nose and ask what is wrong with that, remember that Rosa Parks did not sit on the bus for this, Jesus Christ did not die for this, and hell, freedom for the girl child to vote, own property and go to school was not attained for women to sit still and look pretty. I remember a tweet I saw, where someone said, that Davido’s girlfriend should go to school and not let her life revolve around a man, and that if this relationship comes to an end, she should not say men are scum or carry the feminist tag, because this is not what it stands for. Social media came for the person behind the tweet, asking her if everybody must go to school, that what was wrong with Chioma cooking and following Davido around? Some people often come up with the defense that Nigerian women expect to be taken care of and provided for. To this, I say, these gender roles were created by men, who still whine and complain about it. Do you know that most men feel emasculated when you offer to pay the bills? Do you also know that while they complain of girls eating their money, they still run after these girls and shy away from independent women. You see, most Nigerian men do not want to date a girl with her own money and who has a car, when they don’t, most expect her to hand over the keys to him and boy, I am spitting facts. If I say now that Nigerian Men are not as confident as they claim on social media, they will come for me, so let me kuku shurrup. Our men here are wicked, if you see how they treat white women when they date them, then once they start dating or marrying fellow Nigerian they will remember that we are Africans and our culture allows them to misbehave and expects you to turn slave. You see, we all know this is the truth but they will rather beat round the bush and blame the woman, than admit it. Chinedu from onitsha believes it’s a taboo for a man to cook, but he cooks, takes out the trash and changes diapers while his Oyibo wife watches TV or rests from childbirth. Do you know that if Chinedu married a Nigerian, he will cross his legs in the sitting room while his wife with big tummy slaves for him and changes his diapers because a 34 year old 6 foot tall man is expected and demands to be taken care of like a child but will not want to be treated like a child, even if he acts as one. Did you know that a Nigerian man can confidently cheat on his wife, even have kids outside because he knows she will still stay, because a Nigerian woman is taught that her greatest achievement is marriage. Did you also know that even now I am getting old, I have never seen a social media post where a man calls out men for cheating (Unless it’s the man cheating on his sister. Lol!!!). You see, instead of addressing the man cheating, they are more comfortable telling the woman not to revenge, to also cover his shame and accept the child from wedlock. Did you also know that if the tables are turned, men will not watch war room. Hell, they don’t even marry single mothers but chase after single girls even if they have 7 kids from five baby mamas. Nah, men don’t address this, they’re more concerned with what Chimamanda says next, because God forbid she opens the eyes of the sheeple. Did you know that Meghan’s family insulted her and advised Harry not to marry her. Did you also know that a Nigerian man cannot marry a girl that even her family is against , or hell, marry a divorced 37 year old woman. Yet, they feel like Harry is their kith and kin or that Meghan is the submissive they aspire to have. It’s actually funny how they also have temporary amnesia for all the things Harry gave up to be with Meghan, even resisted the opinions of his largely racist country – for her. Let a Nigerian man just be told by his friends that they don’t like his girlfriend and see him misbehaving like a radio with bad battery. Most people in the UK did not and do not like Meghan. Harry fought for her and defended her, please chew on that, oya swallow it! This is equal sacrifice and both submitting to each other, not one party doing all the giving up and bowing and scraping as is obtainable in Nigeria where one gender is taught to serve and the other, free pass to do what they want. Well, now society is reaping the fruits and of course putting another burden on mothers to start training their sons right, because you see Nigerian fathers can’t be bothered. Did you know that Chimamanda once said that forgiving a cheating partner can also be a feminist decision (Nah, they don’t read that part, they just assume feminists hate men and don’t marry), the catch being, as long as you’re sure he can do the same for you. Did you know, since pre independence, Domestic violence has been rampant and covered up. Children have watched Daddy kill mummy from beating and it’s a hush hush affair. Did you also know Domestic violence only became popularly talked about when women started fighting back and only then. Suffice it to say, that men didn’t fight against it till it started happening to them. Still, they only fight against women killing men in DC rage and comfortably keep quiet when their friend batters his wife and blame her for it. Can you forgive your cheating wife? Take her back? Keep your mouth shut about it? Accept the child from wedlock? Can you tell your family you’re the one with the problem, when they attack and insult your wife for not getting pregnant? Or will you, hard man, hide under the shadow of your wife, let people think she’s barren rather than know the truth about your being impotent. Can you let your wife take a sperm donor when you can’t produce any? Or do we also wait for you to try your luck with other women outside because it’s better for you to cheat than for you to seek legal and moral help. Can you sweep the house and cook for your wife when she comes late from work? Or will you demand her to leave the office early, go pick the kids and come serve you, even if you don’t have a day job? The most important question and finally, can you take what you dish out? This post acknowledges the fact that there are still men who do not behave like those described above and we love and respect these few. It also takes cognizance of the fact that the greater majority have a complex that will take forever to change. This article is for that majority. Wow, love this piece. Pls tell them ooo. Anyway keep up the good work. Girl, this is my first time here and I am impressed!!!! This piece was very well written and timely. We all need to realize that feminism speaks for all of us equally. We don’t hate or belittle anyone because we are feminists. Nigerians are usually very one sided in thinking and I hope this changes soon because it reflects in everything we do. Very well written and so timely!! !